Posted 22 September, 2017 by Peter MacDonald & filed under Uncategorized. Due to an increase in business levels, we’re pleased to announce that we’ve expanded our team, bringing in a couple of new engineers to the 4c family. Alessio Renna comes from Pisa in Italy, he studied Energy Engineering at the University of Pisa and completed his Postgraduate Master’s Degree Thesis at University of the West of Scotland in Glasgow. Before joining the team at 4cE he was working with Continental Automotive Group as an Industrial Engineer, looking at Production line management and improvement. Alessio will be filling a Mechanical Engineering role at 4c. Peter MacDonald is a native Highlander, a graduate of Strathclyde, is a Chartered Engineer with the IMechE, and brings 10 years of experience in Project Management/Project Engineering of heavy engineering in the energy and process sectors. 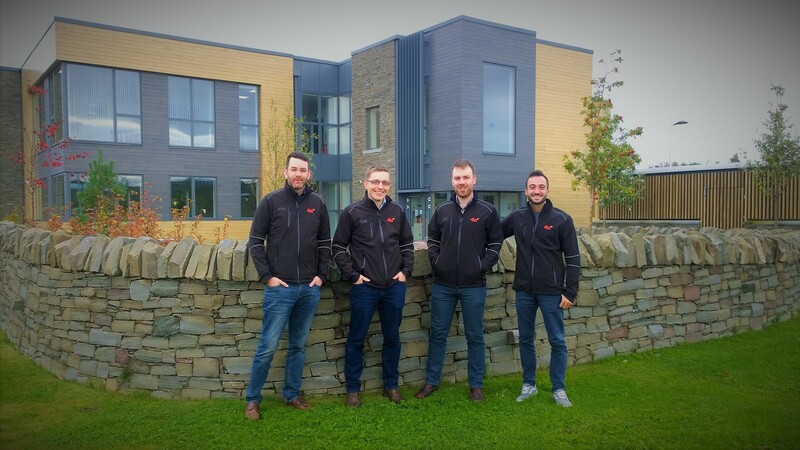 As we’ve added these new faces to the team, we’ve also invested in some new jackets which you can see modelled by the team here – from left to right we’ve got Peter, Andy, Jo & Alessio.